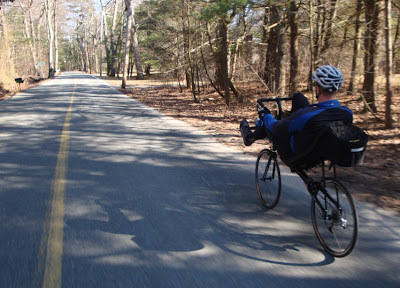 The Boston Recumbent Users Group: On The Road Again! Its great to be back on the road again! A little taste of whats to come. Enjoy these moments while you can. At this time of year,they don't last long! We took the recumbents out for a short spin yesterday! What a treat! Nice to see the view I have missed for so long! Tuesday and Wednesday Rides will become part of the weekly schedule for the Spring and Summer. Check back here for announcements of rides. I can't do Tuesday next week - but Wednesday is looking very good. Weather also looks great. Hopefully I can keep it open.